About 15 years ago, a couple searching for a tranquil hobby to enjoy together decided that two riding horses in their barn would do nicely. What began as a diversion for peaceful afternoons awakened a passion for the Arabian horse, particularly those of Egyptian bloodlines. Today, Henry and Christie Metz�s dedication to the Arabian horse is a driving force in their lives and in their lifestyle. The skills they honed early in their business careers continue to serve them well. This is one dynamic couple that utilizes every hour in the day. You might find Christie fund-raising for the Pyramid Societys' Foundation, or researching next years' breeding selections for their broodmare band. Henry might be in Denver for an AHA board of directors meeting, or presenting one of their homebred youngsters at a regional show. Nowadays, much of the couple's focus is on building their new 120-acre facility in Californias' Santa Ynez Valley. We caught up with them during a weeklong visit to their home in Florida, tending to another of their passions family and welcoming the latest addition: their third grandchild, Henry. Life is good. And Arabian horses are central to it. �Years ago, Christie and I decided that if we were going to have horses, we were going to enjoy them,� Henry says, with infectious enthusiasm. If you'd like to see a man enjoy his horses, just watch him present one of them in an amateur halter class. From his first experience at the Pyramid Society's Egyptian Event about eight years ago win, place, or show, he's had a ball. Bob Battaglia judged the first class I entered, he recalls.As anyone who's been to Kentucky in June knows, it can be hotter than the devil, and it was. I entered the ring with my filly, and said, Hi, Bob. I walked her in, stood her up, trotted her away and back, and then he told me to trot her to the end of the arena and back.Well, by then that looked like a very long way. I asked Bob, All the way? He looked at me (noting my svelte figure) and said,Oh, well, Henry, just go as far as you can! Mr. Metz adds, only half joking, If I could change one thing about the showring, I'd allow designated runners in the amateur halter classes. Humor aside, Henry's competitive nature has garnered a fair share of success in the showring.And nothing, he states, is as satisfying as showing a horse that we've bred at Silver Maple. Take, for instance, the Egyptian Breeders Challenge Fillies ATH class at this June's Egyptian Event. Henry presented their homebred Bint Shaia (BB Thee Renegade x Shaia), whose parents are both owned by SilverMaple and are both Event Supreme Champions. Bint Shaia inherited Shaia's color and sweet nature, and exemplifies what the Metzes believe: great mothers (Canadian National Reserve Champion Mare) make great daughters. When we purchased Shaia in 1995, her quality and caliber brought our program to a new level, Henry recalls. It doesn't really matter if Bint Shaia wins in the showring, she's going to be part of our program either way. Bint Shaia did win. And Henry had his photo taken with the filly, alongside an oversized check for over $26,000. Because he was presenting a friend's horse in the next class, Henry hurriedly dashed to reenter the arena. As he walked the horse along the rail, he encountered Pyramid Director Anna Bishop at her seat. Anna, he asked,do we really win $26,000? Well, the Event does award $120,000 in prize money annually but $26,000 was the total purse for both Egyptian Breeders Challenge classes, erroneously printed on the display check by a new accountant. No, Henry, Anna admitted,You'll take home over $12,000, but not the entire $26,000! But the news of Henry's $26,000 windfall had spread. When I got out of my class, I heard that David Cains was telling everyone that Christie was taking them to Paris! Henry says, chuckling, I had to let them down easy I told them that they'd be going to lunch in Paris, Kentucky, not Paris, France! Christie and Henry met in 1969 at the University of Nebraska in Lincoln, where his major was business, hers, fine arts. Initially, they were pals, and Christie even dated one of his fraternity brothers. But she knew Henry had more than a casual interest when he called after one of her evenings out to inquire if she'd kissed the other fellow goodnight. The couple was married in 1971, and within two years moved to Henry�s hometown, Sioux City, Iowa. There he joined the business his grandfather had founded in 1922, the Metz Baking Company. The family business now spanned the Midwest, from Salt Lake City to Detroit. And the couple�s family expanded, too, with three children arriving on the scene, Jason, now 31, Carrie, 27, and Andy, 26. By 1981, Henry was at the helm of the business, forging new marketing strategies in a very competitive field. Meanwhile, Christie had a flourishing career in interior design and was instrumental in fund-raising for the arts. Henry was active in politics, locally and nationally, attending President Reagan's farewell ball and meeting Mrs. Rosalyn Carter in the White House. Today Christie muses that Henry might well have gone into politics had he not joined the family's enterprise. Little did they realize how well the skills fine-tuned during these years would serve them when their focus turned to the world of the Arabian horse. Henry's political savvy has been put to good use, first as a board member of The Registry, and now as a director of the new Arabian Horse Association. AHA officials are currently not free to divulge plans in progress for revitalizing the new organization, but Henry does voice cautious optimism. Christie and I made a choice to have these horses, and with that comes a responsibility to make things better. In addition to our investment of time and resources, we must also be stewards of the breed. We want to help foster educational opportunities, an abuse-free showring, and a healthy marketplace for the horses we breed. We believe that you get something back only if you put something into it. I'm excited about new events and new types of shows. Change threatens the status quo in order for positive change to occur, enough people need to want to make it happen. Christie is frank. The showring is not my focus. 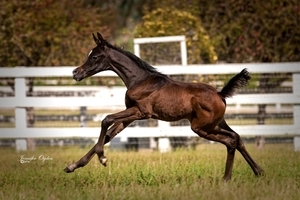 I savor my day-to-day interaction with our horses, whether it's riding, watching the first tentative steps of a newborn foal, or studying pedigrees and making next year's breeding decisions. I really admire Henry's efforts to influence change in the showring, and his ability to inspire. It takes incredible tact and patience because implementing change is such a slow process. He has the ability to envision a broad picture, and the determination to work toward it. We are hands-on owners and breeders, and we encourage people to enjoy and celebrate their Arabian horses, Christie continues. 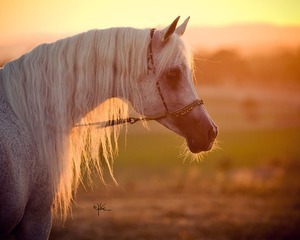 This is the most versatile breed of all whatever your goals, there is an Arabian that will take you there! The first two horses to inhabit the Metzes barn were purchased from Charles and Judy Jones's Atallah Arabian Farm. Judy would become a valued mentor. Henry's gelding,Taj Mo Ali (Ruminaja Ali x Moynese), was straight Egyptian, and Christie's mare, Isah (El Hilal x Shar Mar Gailisa by Azraff), Egyptian related. 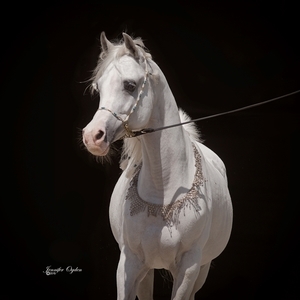 What initially drew them to the Egyptian Arabian their sweet nature, aesthetically pleasing conformation, and ethereal beauty remain the qualities they strive for in Silver Maple horses today. Straight Egyptian and Egyptian-related bloodlines remain the mainstay of their program. Christie has what I call the eye, Henry says.Most people look at beauty and give it blanket appreciation. Christie can recognize the exceptional, and differentiate levels of quality and potential. She had that ability in her design business, and she uses it today evaluating horses and making breeding decisions. The Metzes have bred nearly 100 Arabian horses at their Silver Maple Farm, first in Iowa, then Naples, Florida, and now in the Santa Ynez Valley. Christie in particular is a diligent student of the Arabian's history, pedigrees, strains, phenotype, and genotype. Since the beginning, some things have remained the same, Christie tells us. First, I still have the passion, which I think must be absolute.One must have an intense dedication to the horse, because this is an endeavor that sometimes transcends both money and intelligence. It's a business often ruled by emotion, which is not terribly businesslike. It relates more to the tradition in which it was understood that it takes a long time to build a foundation before you see a profit. And any profit that you make is plowed right back into the business in order to continue to grow toward your goal.